Birds are fascinating creatures to watch and fun to learn about. Invite birds into your yard with a homemade bird feeder so that your kids can learn to appreciate these animals. Get the whole family involved and you have a fun and educational activity to do together. Your child will enjoy helping you create a place for birds to come and eat and they will delight in seeing their feathered friends eat from their creation. 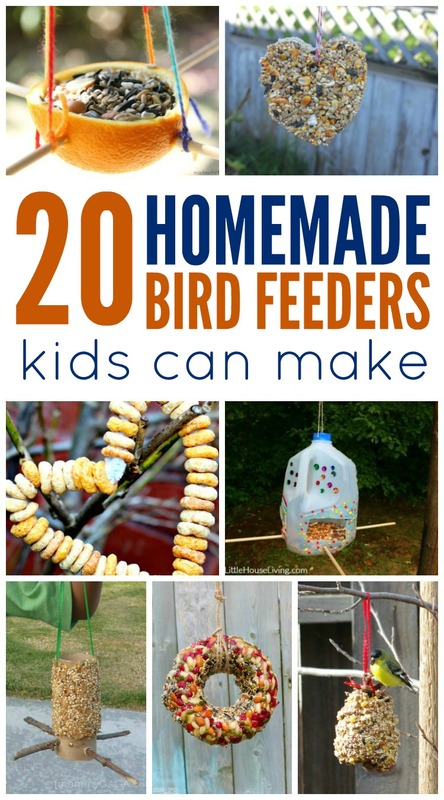 I’ve got a great collection of homemade bird feeders kids can make to share with you today. In addition to making a bird feeder, I would also recommend getting a bird field guide to have handy for identifying the birds you see. This is one that we have and enjoy. My children like to sit outside with a field guide, binoculars, and a notebook and pencil to keep track of the birds they see. You can find more fun family activities here!